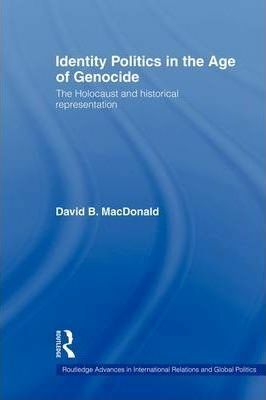 In an era of globalization and identity politics, this book explores how Holocaust imagery and vocabulary have been appropriated and applied to other genocides. examines how the Holocaust has been used to promote animal rights. Demonstrating both the opportunities and pitfalls the Holocaust provides to non-Jewish groups who seek to represent their collective histories, this book fills a much needed gap on the use of the Holocaust in contemporary identity politics and will be of interest to students and researchers of politics, the Holocaust and genocide. Acknowledgements "Introduction: The Holocaust and Identity Politics" 1. "Cosmopolitanizing the Holocaust: From the Eichmann Trial to Identity Politics" 2. "Considering Holocaust Uniqueness: From Hebrew Peoplehood to the Americanization of Memory" 3. "Colonialism, Genocide, and Indigenous Rights: America, Australia, and New Zealand" 4. "Uncle Sam's Willing Executioners? Indigenous Genocide and Representation in the United States" 5. "Australia: Aboriginal Genocide and the Holocaust" 6. "Indigenous History Through the Prism of the Holocaust: New Zealand Maori" 7. "The Armenian Genocide: The Politics of Recognition and Denial" 8. "The Armenian Genocide and Contemporary Holocaust Scholarship" 9. "Nanking, The Chinese Holocaust, and Japanese Atomic Victim Exceptionalism" 10. "Serbs, Croats, and the Dismemberment of Yugoslavia: War and Genocide in the Twentieth Century" 11. "Serbophobia and Victimhood: Serbia and the Successor Wars in Yugoslavia" "Conclusions"
David B. MacDonald is Senior Lecturer in Political Studies at the University of Otago, New Zealand.